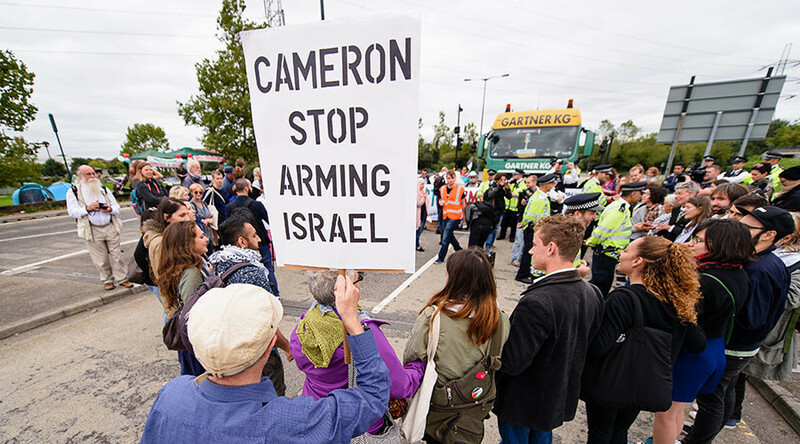 Activists are descending on an arms fair in Cardiff, Wales, on Wednesday afternoon to protest against the British government’s facilitation of weapons trading between small and established arms companies and overseas dealers. The day of action aims to disrupt the arms fair with music, theatre, a “meditation against the arms fair” and direct action. The Defence Procurement, Research, Technology, and Exportability (DPRTE) fair takes place annually at the Motorpoint Arena in Cardiff, and provides a networking opportunity for small and large companies who sell their goods to national and international buyers. The event was originally held in Bristol before protesters forced it to move. It will host arms giants including BAE Systems, Lockheed Martin and Boeing, which have notably sold arms to countries guilty of human rights abuses. “It’s shocking that the Motorpoint Arena would welcome arms dealers to do their deadly business in the middle of Cardiff. Activists in Bristol managed to chase the arms fair out of their city and we’ve resolved to show the arms dealers that there is no welcome for them in Wales either. We are protesting because we want to send the loud and clear message that arms dealers are not welcome in Cardiff,” Local activist Lleucu Williams, who is part of the Stop the Cardiff Arms Fair group, said. Campaign Against Arms Trade spokesperson Kat Hobbs added that it is crucial to hold even smaller arms companies to account. “The DPRTE arms fair exists to help smaller arms companies to sell to larger weapons manufacturers and government. Big companies such as BAE Systems and Lockheed Martin, whose weaponry has been implicated in serious human rights abuses, will be there shopping for parts. Every cog and circuit board that goes into a piece of weaponry is crucial to its operation, and that’s why we want to hold these companies accountable,” she said. The day of action in Cardiff comes as a separate anti-arms protest takes place in London. Stop the Arms Fair has called a solidarity protest to support an activist currently on trial for taking action at Lockheed Martin’s offices during the DSEI arms fair. The activist on trial splashed Lockheed’s office with blood-colored dye and decorated the pavement with outlines of bodies, then pinned a banner to the wall which read “Lockheed Martin: merchants of mega death."